And dreams that it is I? Butterflies are among the most conspicuous and most beautiful of all insects. Along with moths, they make up the order Lepidoptera. There are more than a quarter of a million species of Lepidoptera world-wide, of which about 20,000 are butterflies. Roughly 240 butterfly species have been recorded in Hong Kong. Butterflies are the final stage of a complex metamorphic process that begins with the egg then continues through the larval (caterpillar) and pupal stages to the emergence of the adult. As an adult, the butterfly’s biological role, in its generally brief existence, is to survive and to mate in order to ensure that its genes are perpetuated. Survival has two main components: one of them is the avoidance of predators. Butterflies have evolved a number of strategies to avoid potential enemies. The most obvious one is flight. Many butterflies are swift and erratic fliers, which can make them difficult to catch. Although a large number of butterflies are bright and conspicuous, others have wing patterns that allow them to blend in with their background, thus affording them a degree of camouflage. Perhaps the most obvious species that come to mind are the Satyridae (Browns). These have muted brown colours that match their shaded woodland habitat. The Common Evening Brown and Dark Evening Brown in particular can be disturbed from beside a woodland path, but once they re-alight, can be surprisingly difficult to find again amongst leaves and other rotting vegetation. One other feature of many Browns is the presence of rings on their wings. These rings – dark- centred with a paler surround – probably play a role in courtship display, but as they also resemble over-sized eyespots, they may confuse predators into believing they are looking at a much larger animal than is in fact the case, causing them to leave the “larger” animal alone. A number of Lycaenidae (Blues) have small rings and “tails” on their hindwings, fooling a would-be predator into believing that it is looking at eyes and antennae. The predator may strike at this “head”, enabling the butterfly to fly off (minus parts of its hindwings!). Yet another strategy has evolved, most notably among members of the Danaidae (Tigers and Crows) family. The caterpillars of this family feed on plants which are poisonous to predators such as birds. In consequence, the caterpillars and butterflies become distasteful to the birds and are avoided. The markings on these butterflies render them conspicuous in the landscape and their flight is comparatively slow. Being poisonous, they have no need for camouflage; their coloration acts as a warning to potential predators. Interestingly, a few non-poisonous butterflies from other families have evolved with similar coloration to members of the Danaidae. 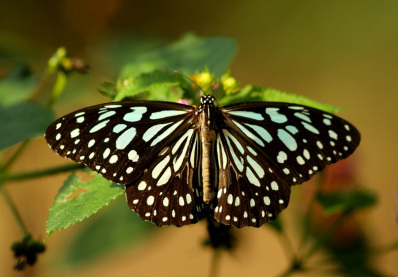 In Hong Kong, for example, the Common Mime and the Red Ring Skirt (the first is from the Papilionidae family, the second from the Nymphalidae) have a black-and- white, striped upperwing that bears a resemblance to the poisonous Blue Tiger. 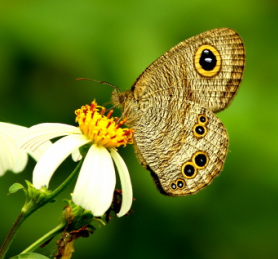 Therefore, these edible butterflies are usually left alone because experience has taught predators that butterflies with a similar wing pattern are poisonous and should be avoided. This is known as Batesian mimicry after the nineteenth century naturalist Henry Walter Bates who first described this phenomenon. Great Orange Tip, Lemon Emigrant, Common Jay & Common Gull "puddling"
It is the second stage of the life-process of a butterfly – the larval stage – that is most associated with feeding, as any parents who have ever read Eric Carle’s classic book “The Very Hungry Caterpillar” to their young children will know. Indeed, caterpillars have more than once been described as “eating machines”. However, although adult butterflies do not grow, they also need to feed to give them the necessary energy to fly and reproduce. 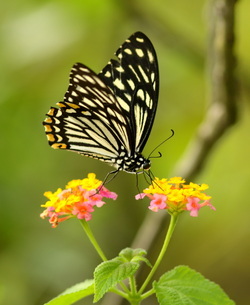 The traditional image of a butterfly feeding is of the insect sucking nectar up from the head of a flower - and indeed many species do use flowers as a source of water and energy-giving sugars. However, any observant walker in the Hong Kong countryside will soon become aware that it is not only flowers that butterflies use as a source of nutrition. Over the past few months I have seen Large Faun feeding on discarded orange peel, Constable, Tawny Rajah and Red Ring Skirt feeding on tree sap, Blue Admiral feeding on the sweat on my backpack, Common Mormon sucking up the juices from dead Sea Urchins and – least romantic of all – Rustic and Spangle feeding on fresh cow dung. Most recently (May 2011), I have seen Great Orange Tip, Common Jay, Common Gull and Lemon Emigrant feeding tightly together on the grey sand at the edge of the stream that flows out into the sea at Lo Kei Wan, south Lantau. Which indicates that butterflies have an eclectic diet. This seems to be based on a need for them to ingest sodium for their neural system to function effectively.